Up until the middle of the 18th century there was no elementary schools open in Safien. However, the Safier could already read and write in the 16th century and this can be proven by the beautiful old handwriting and protocols of the time. It may well be that wealthy families let their children be educated by the parish priest or sent them away to school but is generally assumed that the parents taught their own children to read and write. Reliable data concerning the establishment of the elementary schools is contained in the school protocols from 1744. It is understood that the Gemeinde Safien sold the right, in the region of that time Veltlin to appoint the Gemeinde mayor; to another Gemeinde and that this helped in the process of setting up schools in the individual regions. The neighbourhoods or regions immediately set to work furnishing the school funds and introducing elementary schools. Due to the interest of the veltliner funds not being sufficient enough to pay the teachers the individual households also had to contribute to the acquisition of school funds in the form of taxes. The school rights were therefore bound to the households concerned. In parts school buildings were erected, in other neighbourhoods alternating use of living rooms was used for lessons. The time table was simple. One learnt reading, writing, counting, memorization and singing. The training to be a teacher was poor. Here and there intelligent boys were employed after their completion of primary school at their local school. Through studying and learning alone a lot of these boys continued to add to their education, so much so that soon a few of them received the call from outside their locality to teach in other schools. At the end of the 19th century there were 25 Saifer teachers that taught in Saifen or outside of it. A large contribution to this number was thanks to the creation of a high school at Platz in 1837. A number of the pupils from this school went on later to become teachers. In 1835 the school association of Safien-Tschappina set up a detailed curriculum for all its sub ordinate schools and extended the time table. In 1849/1850 there was in Safien 9 schools with a total of 132 pupils. (Ausser-Camana, Inner-Camana and Bäch, Gün, Neukirch, Proskaleschg, Ausserthal, Innerthal, Platz, Zalön). All schools were comprehensive schools with 9 classes, so that the pupils went to school for 9 winters to the same teacher, and that teacher had more than likely taught their parents too. In 1879 public education and the school funds of the neighbourhood was handed over to the Gemeinde in accordance with the federal and Kanton constitution. Around the same time, due to a decrease in the number of pupils and an increase in the amount a teacher had to be paid the schools were reduced to 4. The schools, determined on a trial basis of two years were: Thalkirch, Camana, Platz-Zalön (alternating) and Neukirch. This interim solution remained in place for 77 years and the pupils of Platz and Zalön went to school for three months in Platz and in Zalön for the other three months of school. Gezügelt was the change over time (approx. on the 20th January). For the transport to school the school authorities made a cattle pulled sleigh available as between Platz and Zalön there was only a sleigh track at that time. The Platzer pupils took a simple lunch in a back pack to eat in the Zalöner school dining room and when school took place in Platz, the Zalöner did the same. Due to the fact that the number of pupils in Platz increased the schools, after 77 years, were once again separated and both Platz and Zalön went back to having their own school. The very simple school buildings were often ramshackle structures and no longer met the required standards. Therefore in 1947 the Gemeinde decided to seize on the opportunity and in co-operation from the political groups new school buildings were built. Moving the schools together was at that time still not an option. To get to school by foot would have been far too long and a road or such for the transportation of the pupils from the farms was still not present. Nevertheless, it was planned that at least in the Platz School, a gymnasium would be built which could also serve as a theatre and as a gathering point for Gemeinde meetings. In 1961 in Thalkirch and with the last of the school buildings inaugurated, the number of pupils decreased so strongly that continuation of the schools was no longer secured. A solution was found after a few years however, with a primary school established in Platz and a high school in Thalkirch. In 1970 the Platzer school buildings were completely renovated and extended. 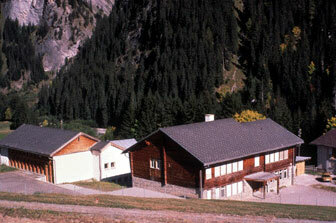 In 1972 all pupils were put together in the Platz School. The School complex in Platz was continually extended. In the year 2002 the new multipurpose hall was inaugurated. The school buildings in Neukirch, Zalön and Camana were rented out by the Gemeinde as family homes and the school house in Thalkirch was sold to a local farmer who used it as his home. The classes in Platz today are in two departments in the school buildings: (Classes 1-3 and Classes 4-6: Swiss schooling system). Safien did not have its own secondary school. Those who went to this school had to travel as far away as Ilanz, Thusis or Tamins and could only come home to visit on weekends. It was therefore an important goal of the Gemeinde to make it possible for their pupils to have the possibility of attending a secondary level school. The four neighbouring Walser Gemeinde Safien, Tenna, Versam and Valendas negotiated for many years to find a common solution. From 1970 the Secondary School in Valendas was used as an interim solution for the four Gemeinde. The School Federation decided, with a vote of 3-1, to build the school in the Oberstufe in Versam: for the main reason that this location was more central than Valendas. The Kanton government then later revoked this decision on financial grounds and voted for the present location in Valendas. The Federal Court then backed this decision. 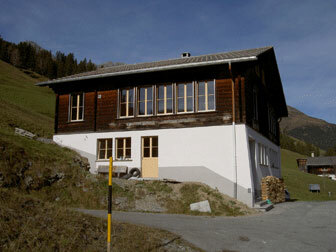 Since 2002 the entire Oberstufe attends the school in Valendas. Firstly they go by foot or sled from farms down to the post office. Then, depending on the starting point, they drive for 1 hour with the post office transport. In the evening they do the same thing but in the other direction and have to walk up to a height of 300m to get back to their homes. The further development of school education will be strongly affected by the continuing decline the birth-rates.